Made in the USA. 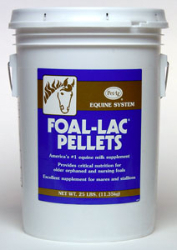 Foal-Lac Pellets is an equine milk supplement for early weaned foals, and for nursing foals before and during weaning. Excellent supplement for gestating/lactating broodmares and breeding stallions. Foal-Lac Pellets offers balanced protein and other essential nutrients for growth in foals. As a supplement to the foal's creep ration. Foal-lac Pellets provide milk nutrients to nursing foals at a time when its mare's milk declines in quantity and quality.